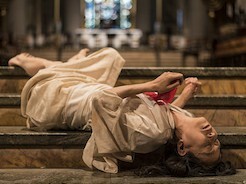 A Body in a Cathedral is an iteration of Eiko's solo work, A Body in Places, taking place during her residency at the Cathedral of Saint John the Divine in Upper Manhattan. 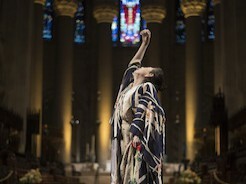 From the fall of 2016 through the spring of 2017, she is offering solo performances within the Cathedral, designing a video installation, and hosting public conversations. A Body in Fukushima, a mutable exhibition of dance photographs created in collaboration with historian-photographer William Johnston, is also a part of the larger art exhibition, The Christa Project. 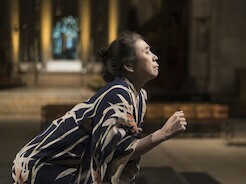 Throughout the residency, Eiko will explore the dignity and transcendence inherent in the ordinary and the disregarded.